A number of local residents have aired their concern at recent fencing work that has been carried out to strengthen the boundary against Penning’s Drove. The fencing has therefore restricted the access to the Woodland. 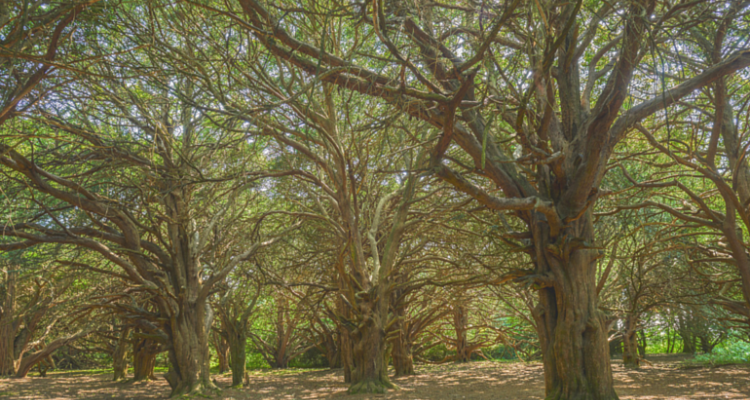 Great Yews is designated a Site of Special Scientific Interest (SSSI) and a Special Area of Conservation (SAC). Contrary to popular belief there are no public rights of way through the woodland and sadly a small number of visitors have not treated its’ environs appropriately. Currently a full arboricultural survey is underway as well as a Yew regeneration project which the Estate is having some success with. The Yew stand has an intimate mix of native Ash dispersed throughout the site which on recent inspection is showing signs of “Chalara Faxinea” or Ash Die Back disease. It is likely therefore that only 10% of the Ash stems will survive and resist this disease. During the summer months it is hoped that Duncan More our Farm Manager and his Team will sympathetically remove all debris and scrap from the Woodland. Some of this has been generated by previous poor agricultural practice but some not. We do continue to support local educational groups and give the opportunity to use Great Yews in a responsible manner. For those of you that enjoy and are planning an atmospheric walk through the Woodland please contact the Estate Office in advance so we are aware of who is legitimately using the Woodland for all the right reasons. The Estate welcomes those who enjoy the landscape and in conjunction with Wiltshire Council maintain miles of Right of Way whether public or permissive.